Officials are investigating whether an equipment failure is to blame for a power outage at Reagan National Airport. Dominion Energy Virginia spokesman Chuck Penn said Thursday that the cause of Wednesday night's nearly 90-minute outage is still under investigation, but preliminary assessments point toward an equipment failure. Travellers inside the airport were left in the day just before 10 p.m.
"We are aware of an airport wide power outage and investigating. Updates to follow," the airport tweeted. More than an hour later, power was restored to the airport, Reagan National said. The airport said "systems are coming back online. Some flights may be delayed." Travelers posted photos and videos of the airport's dark corridors and waiting areas after the outage. 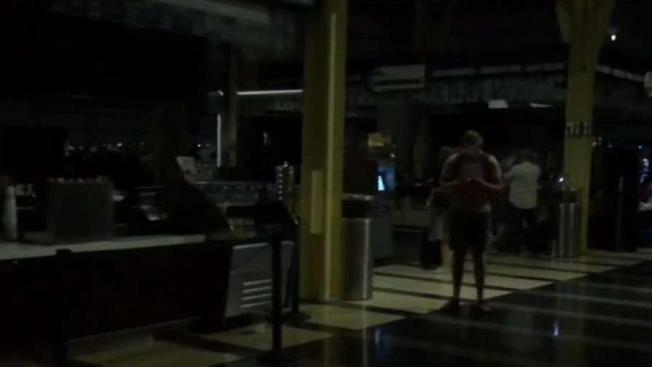 One video shows people gasp and even scream the moment the lights flickered off. Metropolitan Washington Airports Authority spokesman Andrew Trull says Dominion stopped providing power to two feeds because of an off-campus problem. He says backup generators powered critical functions and emergency lighting. Planes were able to take off and land, but he says passengers used air stairs and some workers hand-delivered baggage. Things returned to normal Thursday morning.